I was out of sorts on Sunday. It was a crap day – the weather sucked, I was feeling pretty tired and I was slowly coming to the conclusion that something was going to have to give: if I want to do well in Font, I will have to reduce my running commitments – and that bummed me out too. Anyway, I’ve started following the training ideas that me and Diane developed and as my warm up, I used the Foundry’s traversing wall to practice cross-through climbing and no matching on the L1 traverses. This really does help loosen up my back! After a couple of reps and making sure that I reversed each problem, I moved onto the two L2 traverses and flashed both – such a nice feeling for my ego! I decided to focus on steep terrain and work on foot work in the session, but first I had to dispatch a problem which I totally should have flashed. After using a heel hook (how did I miss that?!) I flashed it and then turned to working steep stuff. I tried a couple of the problems in the Wave, but it was full of Wads and super strong people, and was quite busy. I moved to the low roof and tried to link the bottom of a L2 that I tried on Wednesday. I refreshed my memory and then went for a hold with a lot of force. Unfortunately a blue hold from a L1 problem decided to get in my way (it was totally its fault) and I banged my elbow so bad that it went numb and I wanted to throw up. I sat for about 10 minutes trying not to cry, and waiting for feeling to come back, which it did, but there was no way that I would be able to train any more that day. I was pretty gutted – I don’t have that much time before Font, and I really want to be in good condition when I get there. I tried to do a couple of L1s, but even that hurt and the OH pushed me up the stairs and told me to stop climbing. I finally took his advice and put some ice on the bump. I haven’t done any permanent damage, but it really hurt the next day! After a really good session at the Foundry on Wednesday, I was unsure how things were going to go at the Climbing Works on Friday. I was pretty tired, and in quite a lot of pain – which is gutting. My knees seem to be taking a lot of knocks and my lower back is phenomenally tight. It hurts to jump down from the wall, and hurts to do heel-hooks/rock-overs and other movements. I have been a bit lax on the physio exercises and have started back with them again. Unfortunately, they don’t really seem to be addressing the pain. Following the advice of a PT friend of mine, I’ve started to stretch out my hip flexors and psoas as they are very tight on me and can be compounding the lower back pain. This makes a lot of sense, as I’ve started running more regularly, and (hopefully) with better technique and activation of the appropriate muscles. I do stretch out post run, but if I’m now using muscles that I have only just started activating, they are more likely to become fatigued and get tight. Anyway, I’ll let you know if the stretching helps. So, we got to the Works and it was very quiet (it was mad Friday after all). I warmed up slowly and then took stock on how I was feeling – mainly creaky – but also quite strong. Rather than focusing on one colour, I decided to be a bit like a kid in a candy shop and do a range of circuits. This meant ticking off some wasps, yellows, murples and even some blacks that I hadn’t done before. Considering how creaky I felt, I achieved quite a lot! I topped a Wasp on the slab when I hadn’t been able to get of the ground previously. It required putting a foot up by my hand and leaning off an arete, a bit of a delicate step across and a small pop to the very good top hold. I then did an actual slab climb, which required smearing on grip paint and using the arete and balance and everything! I was super pleased when I topped it. The next slab problem was a bit more cheeky and required timing, balance and technique – usually the things that I’m not great at. It took me a couple of goes to get, but I did and I was very happy. By this point, I was in a lot of pain and decided to start to warm down and stretch out. I think I’m going to start to integrate my physio and stretching back into my training. I’ve taken about 3 months off and now its time to start to include back in again. In general, Friday was a good session. I am slowly improving, and sport climbing is helping me by increasing my endurance to try harder things. Now, I just have to get my body to start liking me again! It was supposed to be Ladies Night at the Foundry Climbing Centre on Monday night. Unfortunately, the two people who I had arranged to climb with couldn’t make it. This meant that I didn’t have anyone to rope climb with. It so happened that the Foundry Winter Bouldering League (#TFWBL) was on. I decided to ‘enter’ so I could at least do something after coming down. It was fairly quiet when I started warming up, but by the time I was ready to do some actual pulling, the wall was rammed. I flashed all the L1s that were set and I really wanted to try some of the L2s. The only one that I tried I cruised until the final move, which ended with a very stretched top move. It’s in the same part of the wall that I’ve trouble with before when topping out. I wish the setters would figure out a way of making the moves interesting for taller people, but not absolutely terrifying for those vertically challenged. I did want to try the problem again but I was getting pretty cold, and it didn’t look like I would get a chance. I went into the other room and played on the 45 degree board for a while. At least until my wrist and middle finger started to hurt. After climbing on Friday I noticed a small lump in my middle finger’s A2 pulley on my left hand. It didn’t hurt that much on Friday, but was still noticeable. After climbing on Monday it started to hurt a bit more. I decided to leave it and go home. In sum, the session wasn’t that productive, but I did get to move and the new problems look pretty fun. I’m looking forward to playing on them on Friday. After my three days straight Wednesday – Friday, I was so ready for a rest on Saturday. Come Sunday, I was feeling marginally refreshed but definitely still sore. However, I still wanted to climb and so we headed to the Works on Sunday afternoon. It was a lovely sunny day, so I was pleased at how quiet the Works was. I warmed up slowly, not entirely sure what I was going to achieve as I was still a bit sore. However, I managed to flash one new yellow, and complete another yellow in two goes! I was very pleased. After that, the session tapered off a bit. I worked a couple of other yellows and figured out how to do some pretty difficult moves on one of them (You can see the starting move on the green leaning column towards the back of the photo. From the yellow volume, you have to reach around to the face of the column, swap feet and then pull hard up the other side.) I could do the first set of moves and then the second set of moves, but couldn’t link them together. I reckon that will come next time. If I don’t knacker myself out beforehand. I managed to do a yellow on the slab – it didn’t really require footwork and then I was so tired! I had a rest, a coffee (how come I have never discovered the macchiato before?! ), and a banana and then tried a couple of more problems. I did the bottom moves on another yellow, but wimped out on the top move. I went for a black instead of the final yellow hold. Saying that, at least I went for something. I started to tire out after that and eventually decided that the best use of my time would be to do some more core work. 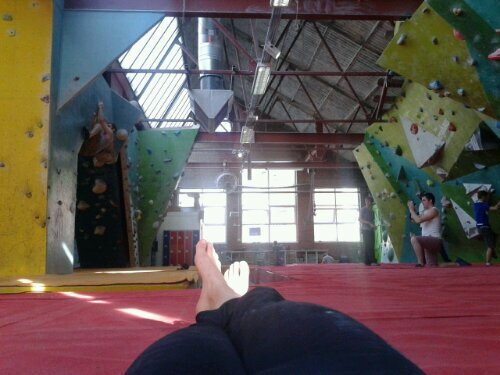 As you can seen in the photo, it mainly involves me lying down and chilling out between sets. I was happy with that! Where I actually climbed stuff again! I’m back (well, almost)! I had a pretty good session at the Works on Friday. They had set the new yellow circuit and have played about with some of the walls, so older circuits had new(ish) problems on them. Both me and the OH felt tired when we arrived at the Works, so I set up with a cappuccino and a nut bar. The OH went for an espresso and boost. I started on the spotties, reds and some greens to warm up before moving onto the purple spotties. After completing a number of these, and also doing a fair amount of gossiping with a friend of mine, I started looking at the yellows. I hadn’t intended to try any of them during this session. I was planning to warm up slowly and then do the purple spotties, or a similar level, before moving onto harder stuff next week. However, I had a look at a couple of them, and thought I may as well give them a try. The yellows are a good set. I really enjoyed the moves that I tried. I managed to flash two problems and then worked a couple more without topping them. I started to feel very tired quite quickly – clearly endurance needs to be improved before Font. While my finger was still feeling a bit sore I still tried some dead hangs on the largest rung of the campus board. It didn’t hurt but I know that it was probably a stupid idea. I tried to do some core work but I totally tanked. It was then time for food, specifically, curry! After the pretty poor session that I had at the Foundry on Wednesday, I decided to go to the Works the day after and try to get some volume in. My finger and knee were still a bit tweaky and I was still very tired, but I wanted to do something! After picking up my car from its MOT (it passed! again! ), I popped over to the Works and started slowly. I warmed up on reds and these felt hard! The set is fairly spicy, but well within my climbing capabilities, so this did not bode well with the whole trying to do volume and getting a work-out aim of the session. After completing all of the reds, I then moved onto the spotties and completed a number of those. My knee started to hurt a fair amount by then, as did my finger. After having a bit of a rest, I tried a couple of more and then accepted the fact that I really wasn’t in the mood/tired and that it would probably be best to go home and go to sleep.